Woody won his heat and posted the fastest time in the prelims to earn a spot in the finals on Saturday. And once again he did it with his kick. LRC analysis. Didn't realize he didn't have the standard. The final guy to watch for is the University of Portland’s Woody Kincaid. 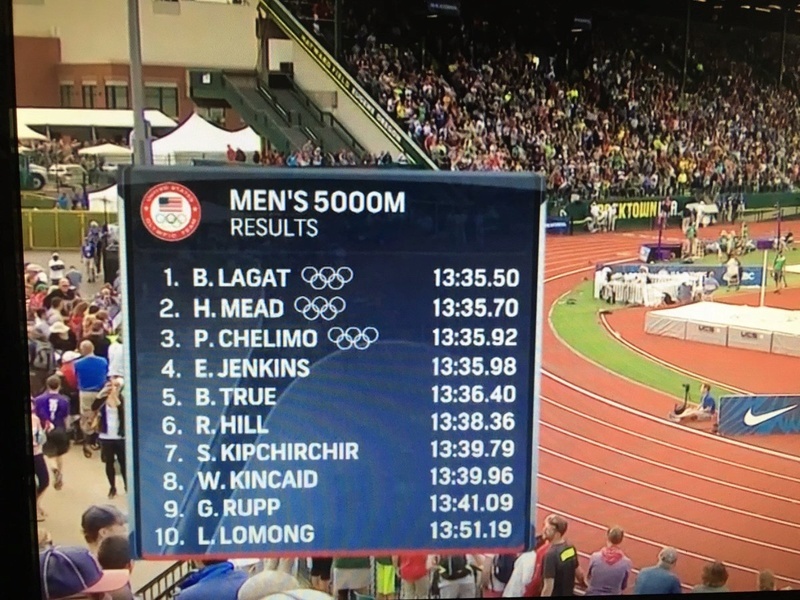 It may seem ludicrous to suggest that a guy who was just 9th at NCAAs four weeks ago could make it onto the Olympic team, but Kincaid beat Rupp on June 23 and closed in 53.72 to win his prelim on Monday. Kincaid’s wheels are the real deal. There’s only one problem: he doesn’t have the Olympic standard of 13:25.00. In a 13:5x race, he’d have an outside shot at a top-three finish. But Kincaid hasn’t fared as well in faster races (NCAAs was fast, and even when he beat Rupp in a 13:2x race, Justyn Knight still beat him handily). It’s a Catch-22. Interesting race. Woody lead for the first two laps or so at a crawling pace. Then, Schrader took off by himself. Kincaid covered the move and it was those two out front for awhile. Eventually the pack caught back up. Woody was boxed in on the last couple laps, but I'm not sure he had the kick left in him. Not sure why he felt the need to cover that early move, especially if he had been content with the slower pace at the start. I know he didn't have the A standard, so I figured he would need to run in such a way to get it. Dude just ran 13:12 today. That's what we call "big time." SouthCarolinaPilot wrote: Who is Woody Kincaid? Thanks, nice article....and it really catches the essence of both Kincaid and Rob Conner....the consummate mentor and teacher.